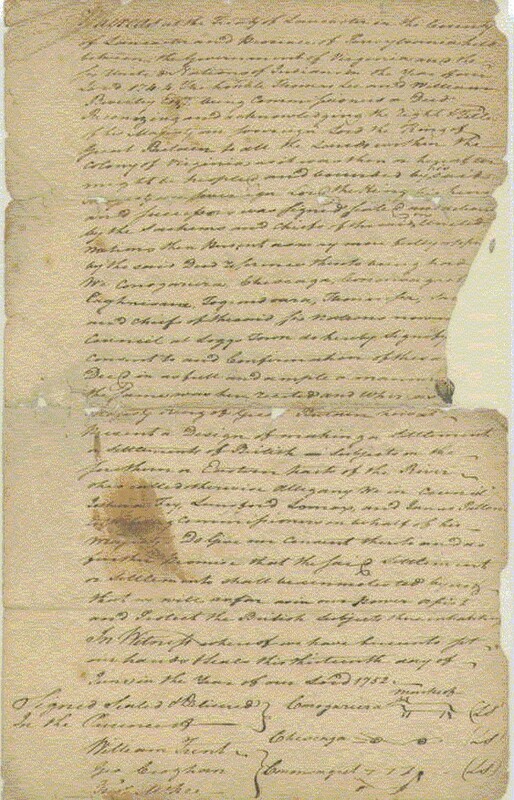 Copy of the Logstown Treaty of 1752, made between Native Americans of the Ohio Valley and delegates from Virginia and from the Ohio Land Company. Owned by Alderman Library at the University of Virginia, part of the Walker Papers. Papers of Walker, his son, Francis Walker, and the Walker and Page families, 1742-1886, Accession #3098, Special Collections, University of Virginia Library, University of Virginia, Charlottesville, Va.
[His] Magesty King of Great Britain has at present a Design of making a settlement of Settlements of British Subjects on the Southern or Eastern parts of the River Ohio called otherwise Allegany We in [unintelligible] Joshua Fry, Lunsford Lomax, and James Patton Eight being commissioners on behalf of his Magesty Do Give or Consent settlement or settlements shall be unmolested by any that we will as far in our power assist and Protect the British Subjects there inhabiting In witness whereof we have hereunto set in our hands [unintelligible] this thirteenth day of June in the Year of our Lord 1752.